It is a matter of general knowledge that a Hindu not infrequently exclaims, when he finds anything supremely difficult to achieve or understand, 'It is like Brahmavidya.' This Brahmavidya or knowledge of Brahman, the attainment of which is thought to be so hard, is acquired only gradually, the steps being those of religion, theology including scholasticism, mysticism and philosophy including science. All these are comprehended by the term Vedanta. Man's knowledge of science having been in its infancy, in the past, it was treated not as a separate subject but as a part of philosophy, which is a rational enquiry regarding all that is known to exist. Though philosophy or vicara comes last, yet it is not introduced abruptly at the very end. Every one, each to the extent to which one's buddhi or reasoning power admits, is by nature free to exercise this faculty, at whatever stage one may be. And as a consequence even the preliminary stages are mistaken by the ignorant for philosophy though the last alone is specifically so called, because it is then that one is able to devote oneself exclusively to a pursuit of the highest or the most comprehensive Truth, by means of buddhi (reason). In the past, rigorous yogic (mystic) discipline, which was not an end in itself, helped to so clarify the mind as to enable it to reason most correctly. But such discipline is almost impossible under present conditions. The modern mental outlook is pre-eminently scientific owing to the great progress that science has made. And the best method of freeing the mind from its inaccurate ways of thinking is to imbue it as fully as possible with the scientific spirit it is therefore only one who possesses a clear knowledge of its methods and results, i.e. who is able to make reason (buddhi) the highest means of enquiry that would be fit to enter upon the study of Vedantic philosophy. 'None who has not turned away from bad conduct, whose senses are not under control, whose mind is not collected, or whose mind is not at rest, can attain the Atman by means of intelligence." (Katha Upanisads, 1.2. 24). In a word, purity of life, comprehending thought, word, and deed, is the foremost requisite for sharpening the buddhi. Recognizing, therefore, the difficult nature of the study of Vedanta as a whole, some of the leading authorities on it have written a number of manuals of introduction. Though all these treatises cover the same ground, refer to the same topic of importance, and point to the same goal, yet they differ from each other in their approach to the subject. 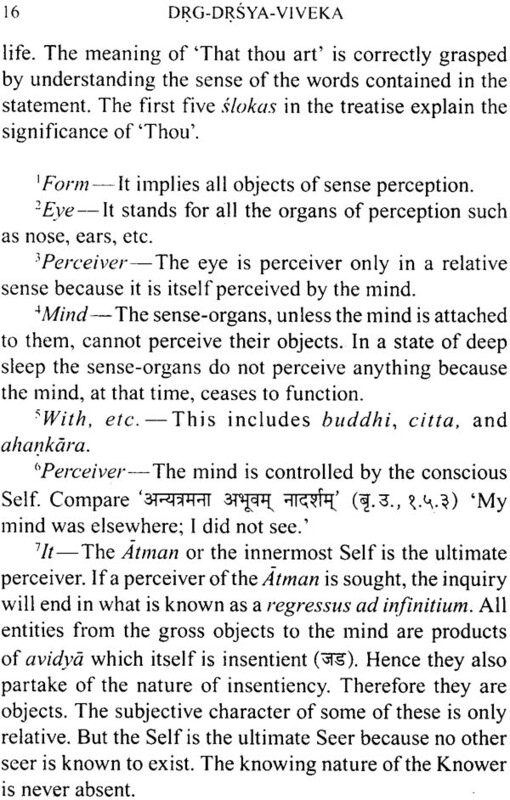 Since these manuals are meant to lead those in the lower stages to rational (buddhi), i.e., philosophic enquiry (vicara), they largely cover the preliminary, i.e., the religious, theological, and mystic, stages of Vedanta, indicating directly or indirectly the way to the final, i.e., to rational, means of attaining the goal. All of them rely on the authority of Vedic Revelation and mystic or yogic ecstasy or Samadhi. But the philosophy, which rises still higher into realms of pure Reason, is evidently reserved for more advanced enquiry. The importance of Drg-Drsya-Viveka as an aid to the study of Vedanta has been well pointed out by the learned Swami Nikhilananda in his introduction to this translation. The central theme of the work is that Brahman is realized through mystic or Yogic Samadhi (concentration). After this state is attained, one can see Brahman wherever one turns one's eyes. Yatra yatra mano yati tatra tatra samadhayah. 'With the disappearance of the attachment to the body and with the realization of the Supreme Self, to whatever object the mind is directed one experiences Samadhi. Problems such as for instance, how to make sure that after we attain Samadhi whatever we see is the Supreme Being or Brahman and not anything else, are matters beyond the scope of this small treatise. Drg-Drsya-Viveka being very short, it necessarily compresses much information into a small space. Detailed explanations are indispensable. Swami Nikhilananda has spared no pains to make not only the English rendering accurate, but also the notes exhaustive and scholarly, which will be found to be of immense help to those who wish to proceed to a higher study of Vedantic philosophy. The Swami's great literary merits are already so well and so widely known that this work of his needs little introduction from laymen like me. It is a time-honoured belief, a belief as old as the oldest Upanisads, that Vedantic Truth is best taught by those that live it but not by those that merely talk it. Bhagavan Sri Ramakrsna Paramahamsa, the 'Real Mahatman' of the late Prof. Max Muller, was one such rare and great teacher. And the Vedantic works that are published by the revered Order of sannyasins founded by such a guru have so great a spiritual charm that they make these works most welcome to all earnest seekers after Truth. Drg-Drsya-Viveka, as the name indicates, is an inquiry into the distinction of the 'Seer' (Drg) and the 'Seen' (Drsya) -an inquiry which is of the utmost importance for the understanding of the higher Vedanta Philosophy. The other name by which this treatise is known is Vakya-Sudha ascribed to Sankaracarya, which is also the name of commentary on it. Drg-Drsya-Viveka has been acknowledged as a Prakarana treatise of the Vedanta Philosophy, i.e., a book which, though confined to a particular aspect of the subject-matter, explains its chief purpose, viz., the identification of Jiva and Brahman, by following a particular line of argument. The special feature of this book is its detailed description of the various kinds of Samadhi (Concentration), the importance of which is always acknowledged by the students of Vedanta. 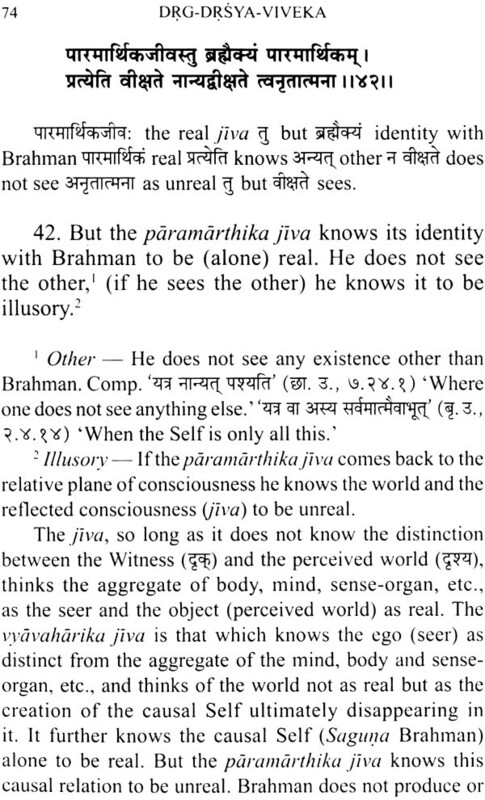 It has also given three theories, necessarily empirical in character, regarding the conception of Jiva (embodied being). This small book of forty-six Slokas, is an excellent vade mecum for the study of higher Vedanta. Sixteen of the Slokas from Drg-Drsya-Viveka, from 13 to 31 with the exception of 14, 21, and 28, are found in a minor Upanisad, called the Sarasvati-Rahasyopanisad. It does not seem probable that the author of Drg-Drsya-Viveka wrote a treatise of forty-six stanzas borrowing sixteen from another book. Neither of the two commentators has mentioned these sixteen Slokas as quotation from the Upanisad in question. Therefore it seems to us that the author of the Upanisad has borrowed these Slokas from Drg-Drsya-Viveka, which, if true, would indicate the importance of the book. Three names are generally associated with the authorship of the book. Brahmananda Bharati, one of the commentators acknowledges Bharati Tirtha as its author. In some manuscripts it is found that Ananda Jnana, another commentator, salutes in the colophon Sankaracarya as its author. Niscaladasa, in his Vriti-Prabhakara, ascribes the book to Vidyaranya, the celebrated author of Pancadasi We are led to think that the book was written by Bharati Tirtha. 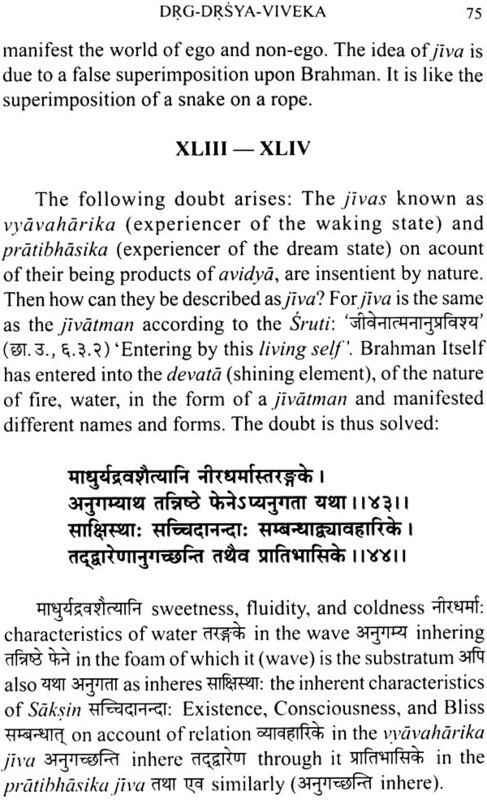 Brahamananda Bharati probably wrote, as some authorities hold, a commentary called Vakya-Sudha. Bharati Tirtha, the teacher of Vidyaranya, was a Jagad-Guru of the Sringeri Math founded by Sankaracarya. The old records of the Math state that he was the head of the Math from 1328 to 1380 A. D. An inscription dated 1340 A.D. states that Harihara I, the ruler of Vijayanagar, and his brother made grants of land to Bharati Tirtha for the maintenance of the Sringeri Math. Probably Bharati Tirtha was also known as Ananda Bharati Tirtha. Bharati Tirtha is associated with the authorship of Drg-Drsya-Viveka, Vaiyasikanyayamala and a portion of Pancadasi. Vaiyasikanyayamala is of great help to the student in understanding the commentary of Sankaracarya on the Brahmasutra. There are two commentaries extant of Drg-Drsya-Viveka. One is by Brahmananda Bharati and the other by Ananda Jnana or Anandagiri. 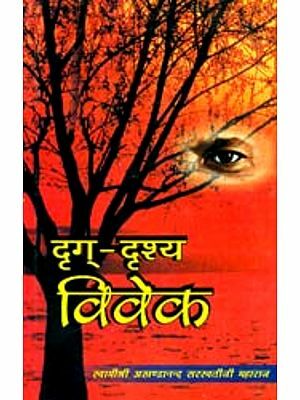 The book has been translated into several languages. 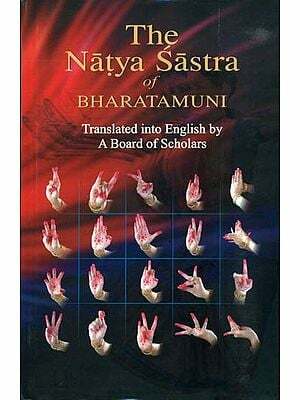 The Bengali translation has been admirably done by Babu Durgacaran Cattopadhyaya, the erudite Sanskrit scholar of Benares, to whom we are obliged for much of the information given in this Introduction. Drg-Drsya-Viveka, in dealing with certain aspects of the subject-matter, follows a method which may be called rational in that it attempts to discuss by employing a method which is known in logic as the method of Agreement and Disagreement or the method of Anvaya-Vyatireka of the Indian Nyaya system. The book, it is hoped, will be of considerable help to those who wish to pursue the higher study of Vedanta Philosophy. For the facility of understanding by the average student, we have given, besides the meaning of the worlds of the text and its running translation, extensive notes mainly collected from the two commentaries, mentioned above. 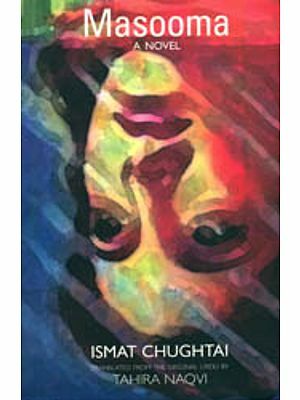 The Telugu, Malyalam, English, Sanskrit and Bengali editions of the book, which we have consulted while translating the treatise, have not always the same reading. We have not followed in toto any of these editions. But our reading will be supported by one or the other of the books we have consulted. We wish to take this opportunity to express our sense of deep gratitude to H. H. Sri Krishnaraja Wodeyar IV, Maharaja of Mysore, for so kindly permitting us to associate the book with his name. Sri Ramakrishna Ashrama at Mysore owes its present position of usefulness to his sympathy and generosity. It is well known His highness' noble father encouraged Swami Vivekananda to proceed to the Parliament of Religion held in Chicago, an event which has raised India in the estimation of the whole of the civilized world. The Maharaja's deep knowledge of philosophy, Eastern and Western, besides his remarkable acquaintance with modern science has made him one of the most cultured and respected of India's rulers.